Southampton council, Hampshire; caused by the resignation of independent councillor Keith Morrell. He was first elected in 2010 and was originally a Labour councillor. We start this week with an unusual by-election in the south coast port of Southampton. A quick walk along the town walls will persuade you that Southampton is an old city; but not all parts of it are old, and the Coxford ward is one of the city’s newer areas. 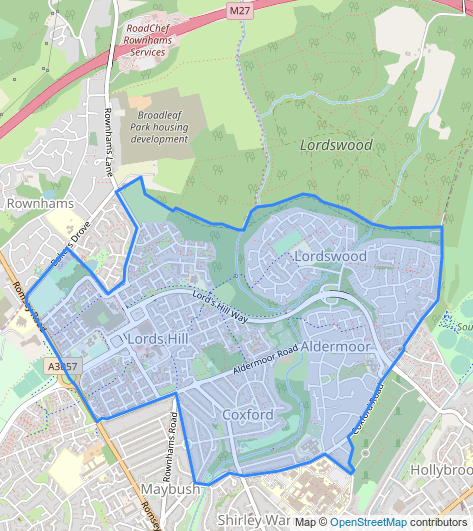 The ward covers the Lordshill and Lordswood areas on the northern edge of the city; these areas were incorporated into Southampton in 1967 and the city council made short work of building new housing estates on them. Lordshill, off the Romsey Road, in particular has high deprivation levels; the ward as a whole has high levels of social housing and low qualification rates. The major local employer is Southampton General Hospital, which lies just outside the ward boundary. 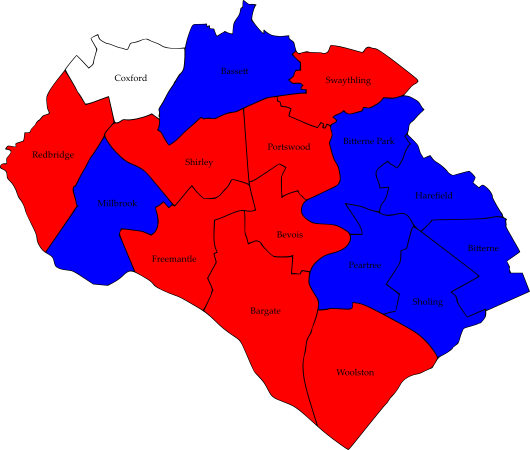 Southampton got its present ward boundaries in 2002, which was a time when all three of the major parties had strong representation on the city council. Coxford ward at this point was a Lib Dem/Labour marginal with the Lib Dems normally having the better of the results; and this continued until 2008 when the Conservatives came through the middle to gain Coxford with just 32% of the vote, in a result where all three parties finished within 3.1% of each other. 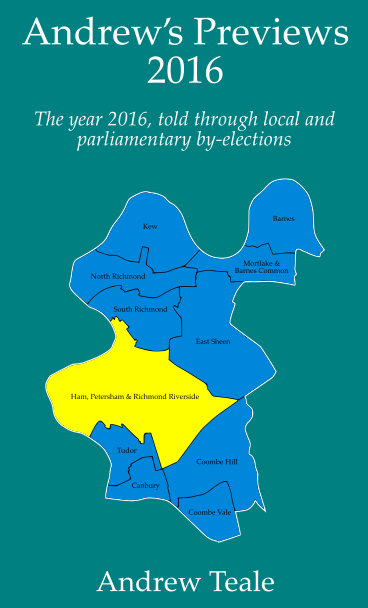 That 2008 result marked a realignment in Southampton’s politics, with a Tory landslide delivering fourteen of the city’s sixteen wards and overall control of what had previously been a very balanced council; the Southampton Liberal Democrats were wiped out, and have yet to recover. That Lib Dem collapse left Labour in control of Coxford’s election results, and by 2012 the party had all of the ward’s councillors. But in that year Labour gained overall control of the council in the Age of Austerity, and were faced with making cuts. The Labour group proposed closing the local Oaklands swimming pool to save money; and two of their Coxford ward councillors, Don Thomas and Keith Morrell, left the party over that issue to form an anti-austerity political group. The swimming pool was saved, Morrell and Thomas were both re-elected and Don Thomas’ daughter Tammy gained the final Coxford seat in 2016. Although Morrell and the Thomases were officially elected as independents after leaving Labour, their group on Southampton council was called “Putting People First”, and in practice they were sponsored at election time by the seriously left-wing Trade Unionist and Socialist Coalition, one of the larger entries in the ever-changing alphabet soup of small parties which fill the political space to the left of Labour. Whatever support they got, it was clearly effective; in May 2018 Morrell was re-elected for a third term on the council with 47% of the vote, to 28% for Labour and 16% for the Conservatives. The Putting People First group decided to disband last year, and Morrell has now resigned leaving an open seat on the council. So this by-election will be a free-for-all, and everybody seems to want a piece of the action with no fewer than eight candidates having been nominated; if you exclude the City of London, this is the longest ballot paper for an English single-member local by-election in over two years. So this is a ward which has been through several turnings of the tide in quick succession – rather appropriate for a city on Southampton Water, where every tide produces not one but two peaks of high water. This by-election looks like it will mark another turning point – but in whose favour? Morrell was latterly elected as an independent, and there is one independent candidate on the ballot paper: he is Ricky Lambert, who is not the former Southampton FC striker of that name but does stand regularly as an independent candidate in Southampton elections, so far with a notable lack of success. Lambert finished last of six candidates in this ward last year, although just to confuse matters he appears on the Local Elections Archive Project under his birth name of Richard McQuillan. Putting People First’s politics were anti-austerity, and hoping to fallow in that vein is Sue Atkins who has the nomination of the Socialist Alternative. Labour will no doubt want Morrell’s seat back, and their candidate is Matt Renyard, a software engineer who was runner-up here in last May’s election. Hoping to repeat the 2008 result in which the Tories came through the middle to win is their candidate Diana Galton. Also standing are Sam Chapman for the Liberal Democrats, Cara Sandys for the Green Party, David Fletcher for an outfit called “Integrity Southampton” which appears to be yet another UKIP splinter group, and Derek Humber as the official UKIP candidate. Croydon council, South London; caused by the death of Labour councillor Maggie Mansell. A veteran of local government, Mansell was first elected in 1986 and had represented Norbury on Croydon council continuously since 1994. She was Mayor of Croydon in 2005-06, and was the Labour candidate for Croydon and Sutton in the 2000 London Assembly elections. Our remaining two by-elections are both being defended by Labour, but are wards which are very different in character. We start in the south with that most urban of urban areas, south London; rather appropriately for a name which literally means “north borough”, we are at the northern end of the London Borough of Croydon. This is an area on the old road from London to Brighton; the A23 passes through the ward running south from Norbury railway station, which is on the Victoria-Brighton line although only local trains stop there. There are plenty of them, though: with its seven trains every hour to London, Norbury handles 3.5 million rail passengers every year. Norbury station was rebuilt in 1902 at the same time that much of the ward’s housing was being built, and around the same time that Arthur Conan Doyle was tormenting Sherlock Holmes with mentions of the word “Norbury” to remind him of one of his few failed deductions. The ward’s Edwardian terraces are in an area which has changed demographically rather a lot since they were built, and the 2011 census picked up significant populations born in India (particularly Gujurat), Jamaica and Poland. 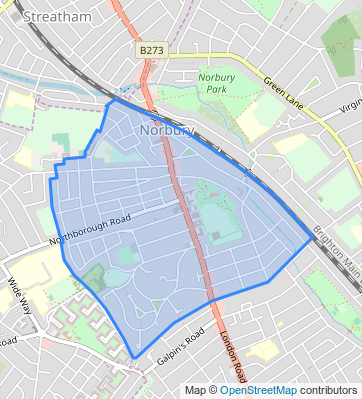 Ward boundaries changed in Croydon last year; in 2011 the present ward was the southern part of Norbury ward, which made the top 100 wards in England and Wales for black population (25%). Some measure of that demographic change can be seen in the local election results. Maggie Mansell was on the Labour slate which won Norbury by just 3 points from the Conservatives in 1994; but the Tories are nowhere here now. In May 2018 – the only previous result on these boundaries – Labour led the Conservatives here 68-22, with the Greens being the only other party to stand candidates. This by-election has a wider choice for the electors of Norbury and Pollards Hill, with seven candidates nominated. Defending for Labour is Leila Ben-Hassel, vice-chair of the party’s Croydon North branch; she works for the City of London Corporation as a project manager in public realm planning. The Tories have selected Tirena Gunter who has stood for election to Croydon council six times before, so far without any success; she fought the old Norbury ward in 2014. Also standing are Rachel Chance for the Green Party, Guy Burchett for the Liberal Democrats, Kathleen Garnier for UKIP and independent candidates Mark O’Grady and Margaret Roznerska. Durham council; caused by the death of Labour councillor Robert “Leo” Taylor at the age of 77. A long-serving veteran of local government who worked for 35 years as an administrator with ICI, Taylor was first elected to Wingate parish council in 1991; he made the step up to district council level on the old Easington council in a 2002 by-election, and was the chairman of Easington council in 2008-09 – nobody succeeded him in that role, as the council was abolished in 2009. In the 2013 Birthday Honours Taylor was awarded the British Empire Medal in recognition of his community work; a month earlier he had been elected to Durham council, being re-elected for a second term in 2017. We move from South to North, from city to village, for our second and final Labour defence of the week and the first in a three-part series of by-elections in County Durham. Wingate is a name with many associations – from a superlative Lancashire brass band to the commander of the Chindits – but in electoral terms it’s a village just to the west of the A19 Teesside-Sunderland road. The village didn’t really exist until the 19th century, when coal was found under the area and a pit village sprang up. Coal isn’t mined in Durham any longer, but Wingate has good road connections to the major local employment centres at Durham, Peterlee, Teesside and Sunderland making it an attractive commuter area. Politically, this is of course a very strongly Labour area. This year Durham Labour will celebrate 100 years of continuous control of Durham county council, and Wingate is very much in the red column. From 1983 to 2007 it was represented in Parliament by the man Labour love to hate, Tony Blair; his successor as MP for Sedgefield, Phil Wilson, easily weathered a small swing to the Conservatives in the 2017 general election. That was shortly after the May 2017 Durham local elections, in which Taylor was re-elected for his final term with 74% of the vote. There are several unusual features about the candidate list for this by-election. Ons is that the four candidates all live in different postcode areas. 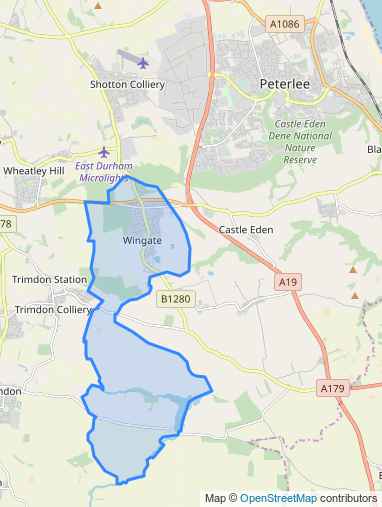 The only candidate to live in Wingate (which has Teesside postcodes) is John Higgins, who is the defending Labour candidate and whose socialist credentials are impeccable; Higgins is from a mining family, and his father represented Wingate Colliery in the so-called “Pitman’s Parliament” in Durham. Another unusual feature is that there is no Conservative candidate; the Tories ran second in Wingate in 2017 with 14%, and do normally make an effort to contest as many local government seats as possible. Excluding the City of London and Northern Ireland, this is the first by-election which the Conservatives have failed to turn up for in over a year; the last poll without a Tory was in Trevethin in Gwent, in February 2018. So the opposition to Labour in this by-election is from a rather unfamiliar set of parties, although one of them does have a track record here. 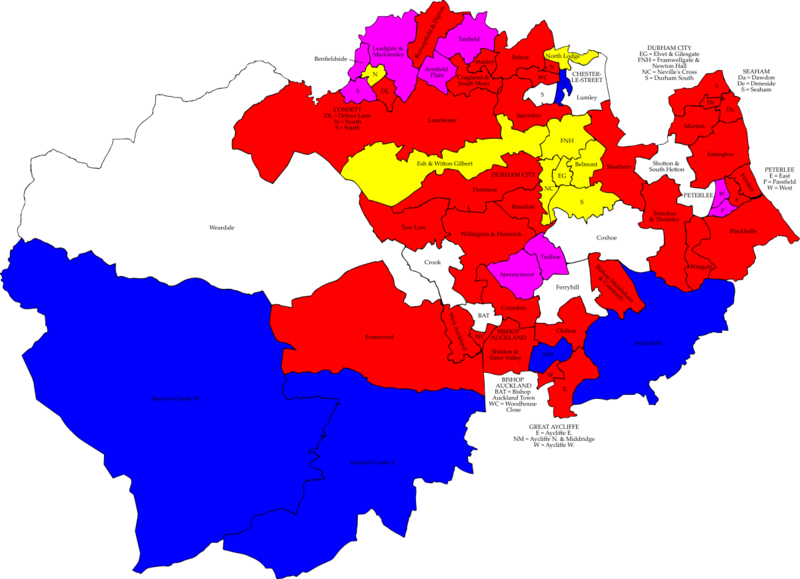 The North East Party finished third in Wingate in 2017 with 10% of the vote; this is a serious regionalist movement which won three seats in the 2017 Durham elections and were within a whisker of winning two more. All of those North East Party seats are in nearby Peterlee (which has Sunderland postcodes) from where their candidate Stephen Miles hails. The Liberal Democrats’ Edwin Simpson (from Esh Winning, which has Durham postcodes) hasn’t been put off by the fact that his party polled just 21 votes here in 2017, the lowest tally of any candidate in that year’s Durham elections. Completing the ballot paper is Gareth Fry (from Newton Aycliffe, which has Darlington postcodes) who is standing for the For Britain Movement.